How to protect your computer from keyloggers? The program which are specially used to detect and protect your computers from keyloggers are Antiloggers, I have tested lots of Antiloggers and found Zemana Antilogger only which is capable of detecting almost every keylogger. 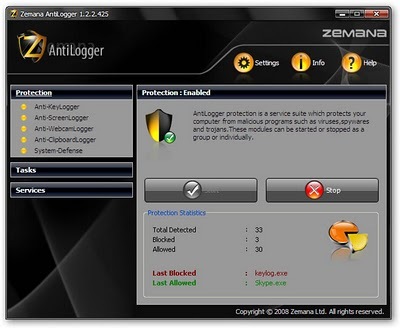 Zemana AntiLogger now covers pretty much every aspect of Windows including registry modification and dll injection prevention and protects Windows from other spyware-related techniques with Anti-Keylogger, Anti-SreeenLogger, Anti-WebLogger and Anti-ClipboardLogger tools of its own. Another useful feature this apps has is while-list approach (in contrast to Anti-Virus blacklist approach) meaning it automatically recognizes "safe" programs and does not treat them as "suspects"